97% of the Antarctic continent is made of ice… the rest is rock. The Antarctic Peninsula extends northward for about a 800 miles, but the sailable area is the top 300 miles. Further south ice become more impenetrable for a small boat, protected anchorages are rarer, and the wildlife disappears. We arrived in the continent through the South Shetland, anchoring first at Deception Island and then waving our way southward protected on one side by the Barbant and Anvers islands and on the other side the continent. We went as far south as Hovgaard Island until blocked by ice . Floating ice was particularly abundant this year, and increased as we progressed South. On the move, big icebergs are not an issue as they are visible, but small growlers, the size of a car, are harder to see when there are white caps around and can inflict a lot of damage in case of collision. They can easily rip your rudder off, or your propeller or even sunk your boat if it is made of plastic. As we moved south pack ice became an issue. We had some interesting if not tense moment trying to pick our way through the Lemaire channel, when ice became more and more dense and the current started to swirl. At the narrowest point of the channel there was mostly ice and little free water and we just simply had to bash our way through for a couple of hours. The noise and jarring impact on the boat were heart stopping …. but we went through and the boat showed little damage saved for scarred anti foul paint and the frayed nerves of the skipper and crews! 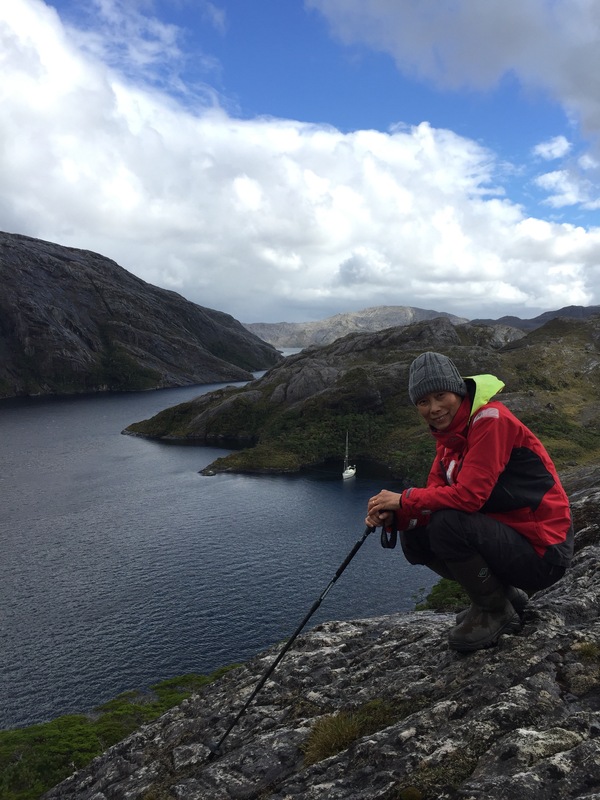 The bigger challenge we faced was to find anchorages protected from floating ice. Ice movement is erratic and is driven by both current and wind. The safer anchorages are those shallow enough to stop big ice, but they are few. Deeper anchorage often required ice watch at night. We had to move during the night quite a few times , once in a real hurry as we became threatened by the arrival of large ice floes which could have locked us in or pushed us against the rocky shore. With 8 lines to shore as we were expecting a blow and Vera our buddy boat was along side us, we had to do very quick dinghy work and as we lifted the anchor the ice was starting to graze our side, we then motored in semi darkness amongst threatening ice floes and gale force wind to a relatively more protected anchorage. We had decided to take on an extra crew for this journey, something we rarely do as we prefer sailing the two of us, Lynn and I. We met Javier , a professional bee keeper, on the pontoon in Ushuaia as he was looking to acquire some sailing experience in Antarctica. He turned out to be an excellent crew and a safe pair of hand at the helm having raced dinghy as a teenager. An additional crew was a real peace of mind for us for sailing the Drake, keeping ice watch, and arranging ( or removing) shorelines in challenging conditions. Thanks to him. We also sailed most of the trip in the company of Vera a Swan 47 skippered by our good friends Michael and Britta. It was great for company , but also comforting to know that in case of problem there would be another boat around. We spent quite a few evenings together watching ” Pride and Prejudice” BBC serie. A very enjoyable time and perfect way to escape the vagaries of the ice down South. Haiyou performed very well, and is perfectly suited for this type of work thanks to the indoor watch keeping station , panoramic view, sturdy aluminium construction and redundancy in most systems. These bigger ice floes almost trapped us later on. We had to bash our way through and It was no fun. I can reasonably say that of the handful of sailing yachts our size we met sailing these waters, none were better equipped for comfort and safety than Haiyou. But this journey was not a “walk in the park”, and as a skipper I felt the weight of being responsible for the safety of the boat and its crew in this unforgiving environment where minor problems can quickly turn into life threatening situation. The pressure was always on for the almost 2 months we were South without respite as no anchorages were totally safe from the ice and only lifted off my shoulders once we reached the safety of the Micalvi back in Terra del Fuego. Who is complaining about ice floes? But the sight of Antarctica’s pristine environment, glistening in the sun or foreboding under stormy conditions and the satisfaction of having conquered our fears will stay with us forever. Both Lynn and I are keener than ever to explore the more remote part of this world… I am a very lucky man! Here are some technical details for all the maniacs like me. The diesel drip stove I installed was a success, consuming 2.2 liter per day ( on for 16 hours per day) and keeping us warm and dry. All in all we consumed about 500 litres for motoring and heating the boat. The engine died once , of course at the most critical time when fighting the ice in Lemaire channel. But I correctly identified the issue as an air leak at the parker filter and switched to the other filter. For once I was happy to have a turbo engine, resulting in a lot of power in the few critical instances we needed it, as well as reducing overall fuel consumption. The boat performance when motoring with a fixed prop ( as opposed to our usual folding J prop) has increased by 20% the impact under sail is a loss of 1/2 knot of speed in apparent wind below 15 knots which I feel is acceptable. I might keep the fix prop on if I can resolve the annoying whistling noise when sailing with the prop locked in reverse. I have permanently rigged the 4th reef in the main and it is great in wind of 35-40 knots forward of the beam. No serious issues to report except for slightly brackish water from the water maker, and some klonking noises in both jefa autopilot power units, which the Jefa technician assures me is normal??? The 500 miles stretch of water extending from Cap Horn to the Antarctic peninsula , called the Drake passage , has been dreaded by sailors for centuries. In a boat like ours it takes 3 or 4 days to cross it but strong depressions sweep through it in average every second day, sometime every 12 hours and the raising of the underwater continental plateau south of Cap Horn makes the sea state treacherous . You might also encounter ice and fog as you get closer to the white continent. It is a bit like trying to cross a bowling alley without being hit by a ball. I had spent quite a few sleepless nights stressing about this passage, probably the most challenging of my sailing career. But if we wanted to go to Antarctica we would have to cross the Drake back and forth. The basic strategy is to leave after a blow and arrive before the next serious one and to avoid anything serious (over 40 knots) in proximity of the Horn . Then having picked you window and left the safety of our last anchorage, you hope and pray it will not close while underway. But there are no garantie in this game, especially on the return as the worst weather is south of the Horn at the end of return journey and a typical weather forecast is not very accurate after 48 hours! We picked our window very carefully, and waited about a week just before heading South, and 10 days in Melchior islands on the way back. 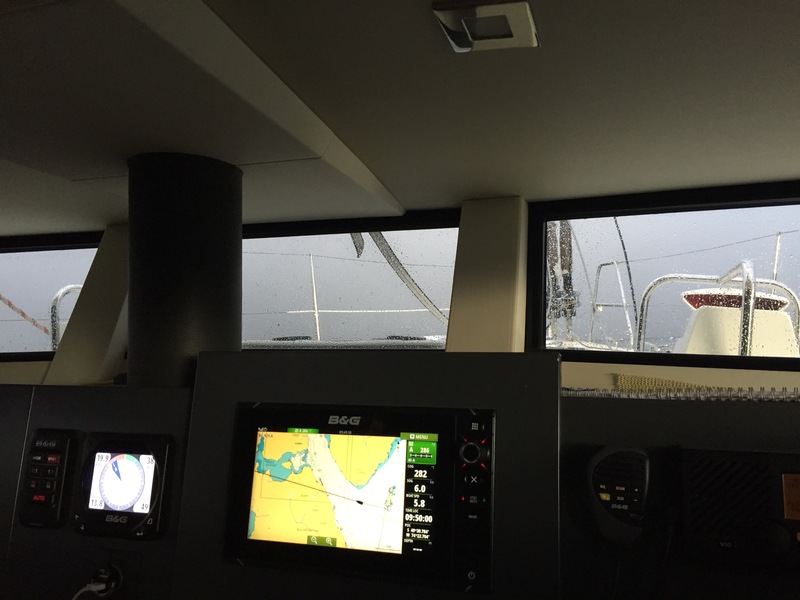 Both windows remained open for each crossing and we never experienced more than 35 knots and 4 meters waves. We met some ice but it was very visible on the radar. So all in all the crossings were easy sailing, with 25 % motoring or motor sailing, the rest of the time reaching or downwind sailing. We even flew the gennaker for a complete night. Something I said I would never do. But friends who left a few hours before us had very bad weather compared to us. The biggest challenge we faced was fluctuating wind strength and direction about 100 miles south of Cap Horn on the way back, resulting in a broaching incident which could have been serious in breaking seas. 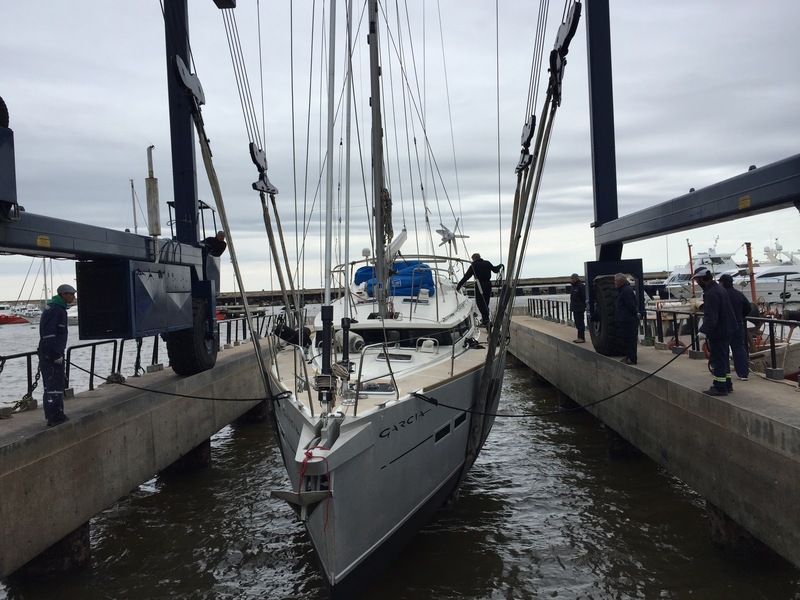 The wind suddenly increased from 18 knots to 35 knots while wing on wing and the combined effect of wind pressure on the mainsail with 2 reefs and 4 meter-waves pushing the stern caused the boat to accelerate and as the bow buried itself into the next wave to luff uncontrollably. We ended up 90 degree to the waves and wind , heeled at pronounced angle and moving sideway. It took us quite a few minutes to get out of this uncomfortable position, but fortunately the waves were not big enough to put our mast in the water or worse to capsize the boat. The lesson learnt is that I should have tucked a 3rd reef when half an hour before the wind started to flirt with 25 knots from time to time. So for us the Drake has been more stress than pain, but you must treat it with respect.It felt like walking across the back of a ferocious beast while it is asleep. You hope it will not wakeup and its groaning and shaking while asleep give you no illusion as to the violence of its nature. We tip toed and the beast did not wake up! The reward of sailing in Antarctica was well worth the effort. 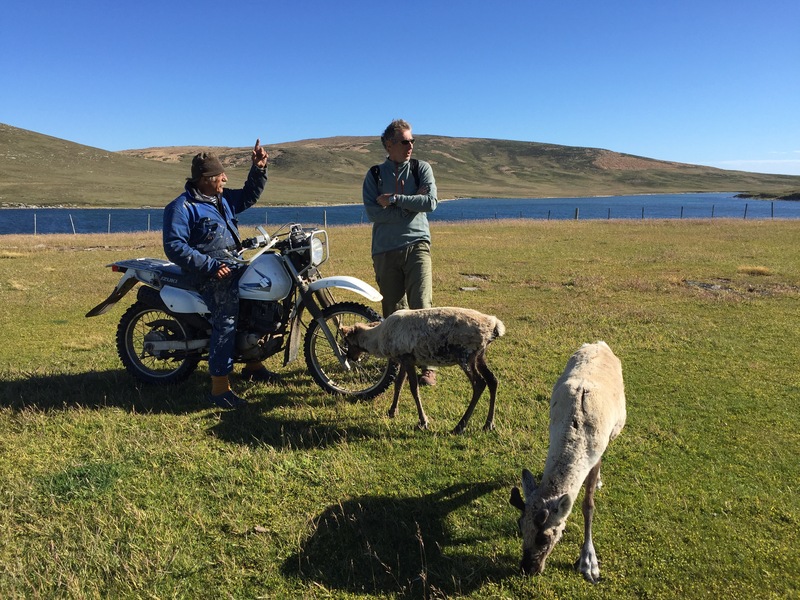 Here we are at the beginning of our 4th seasons on Haiyou. We had a fantastic time in France, soaking up the generous sunshine of this year northern summer, and the warmth from family and friends reunion.What a pleasure! But now it is back to business. We found ice on deck when we arrived back from Europe early in the morning of September 12. 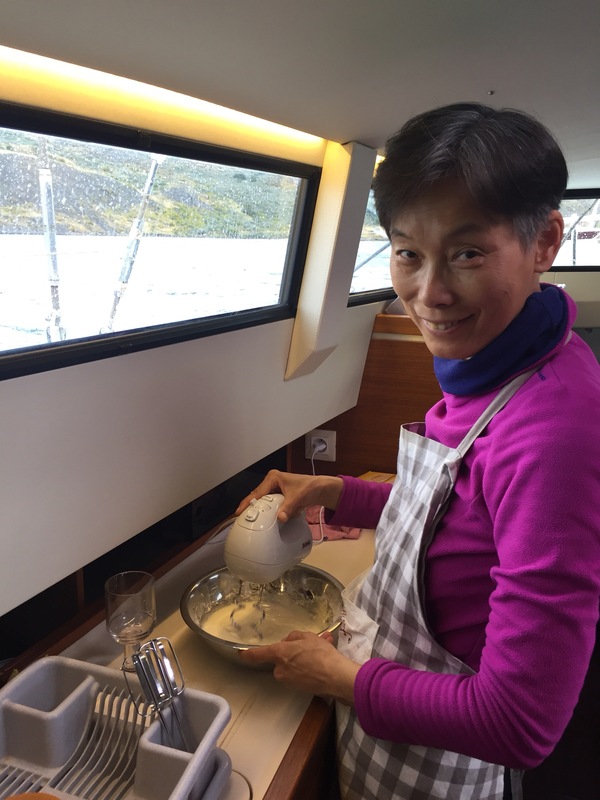 We found Haiyou in good shape under the watchful eyes of Marcello, the local marina manager, and Rene, a good Swiss friend who has wintered on his boat next to us. No traces of humidity in spite of the incessant rain. The heater was on right a way and has rarely been turned off since. Rene our Swiss friend is 3rd from the right. Sitting with other cruisers, listening to Marianna’s tale of sailing all the way up outside the channel due to a broken engine: a serious achievement! I launched myself into a project which had pre occupied my mind for a while : the installation of a Dickinson diesel stove we carried in our bags back from France. It took me about 3 weeks of work as I did not want to ruin the integrity of the boat nor its good look. A typical work day would start on google translate to rehearse my inexistant spanish vocabulary before going to the steel fabricator or the ferrateria , a 20 minutes bus trip away. Invariably, by the time I reached the workshop my little spanish knowledge had evaporated and it was back to sign language and small drawings. Chileans are very patient and with time every thing can be found in Valdivia and if not fabricated. One shop would sell stainless nuts and bolts, but not stainless screws, those were found at the other end of town in an industrial tool shop, but stainless clip would be found somewhere else yet again. I have a very good knowledge of Valdivia industrial surburbs by now. The culmination of the stove installation was the cutting of a 13 cm hole in the coach roof (5 inches) for the stove pipe to go through. This required serious mental preparation and a lot of head scratching as no true sailor likes to drill a hole in the deck of his boat as for a 5″ one, this could be cause for serious mental disorder or marriage breakdown. The 5” hole in the cabin top. What have I done? But everything went well and we now have a good looking and seriously hot stove in our boat. It is great when the outside temperature is below 10 degree C, otherwise it is a little too hot and we have to open the hatches. Lynn lounging next to the fireplace… what a luxury! During this time, Lynn toured the region with our friend Bill and Licen who came for a visit from the US, loaded with spare parts for me and Chinese food for Lynn. With Bill and Licen, both uni friends from Lynn. Bill was very quick to adopt the local dress code: beannie always on! For the last week she has been busy provisioning the boat for another season in the south. I have been doing the last boat preparation. Next week we will push off from Valdivia, reaching Terra del Fuego’s Puerto Williams by mid December, and then onward to Antarctica if all goes as planned. We have finally reconnected with civilisation and are securely tided up at the Yacht Club in Validiva, a university town 500 miles south of Santiago. 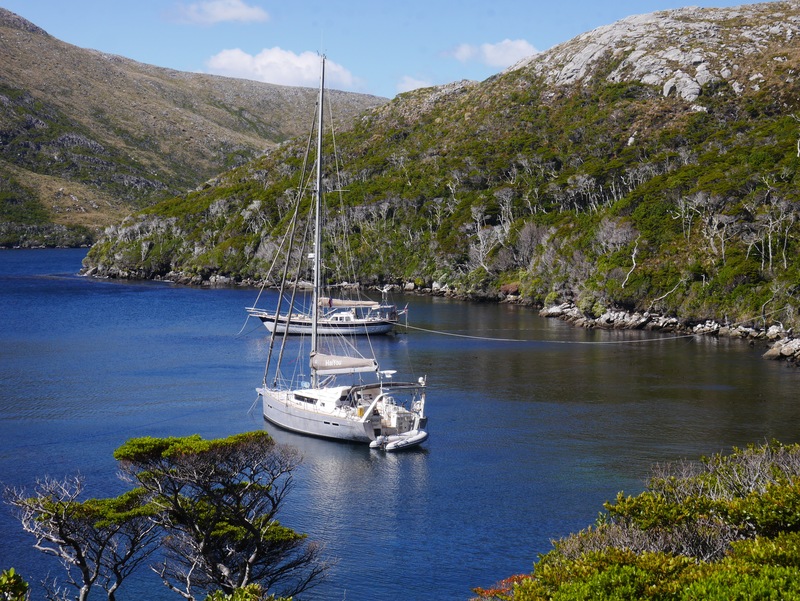 We arrived yesterday having covered 1600 miles in the patagonian channels in about 2 1/2 months. Overall it has been a very smooth trip. The amazing lanscape all the way was well worth the almost incessant rain, adverse wind and cold temperature. But we are happy to have reached the more gentle world of temperate Chile. For the last week or so we have had sunshine, the first time in many weeks and it felt really good. The plan now is to do boat maintenance, before leaving it here for a few months to visit family and friends in France and China. We will return in mid September to get it ready for Antarctica, which will be our next destination, provided we get all the neccessary permit , insurance and gear in time. Leaving Puerto Eden at dawn. The moon is still visible. Population 150, 6 meters of rain per year in average. 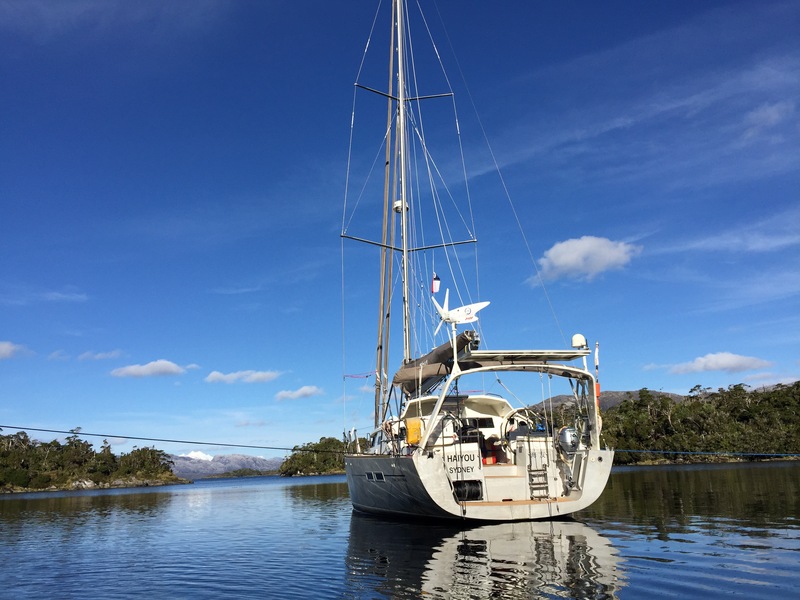 A good anchorage on a rare sunny day – Note the built in rollers for the dyneema lines: a real luxury! 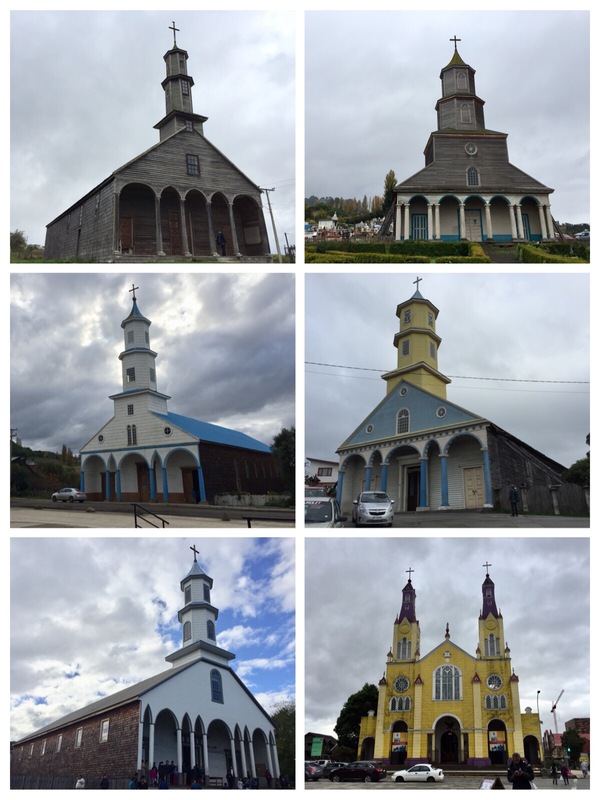 Wodden chrurches of Chiloe just north of the patagonia channels : a skill transfer from boat building! 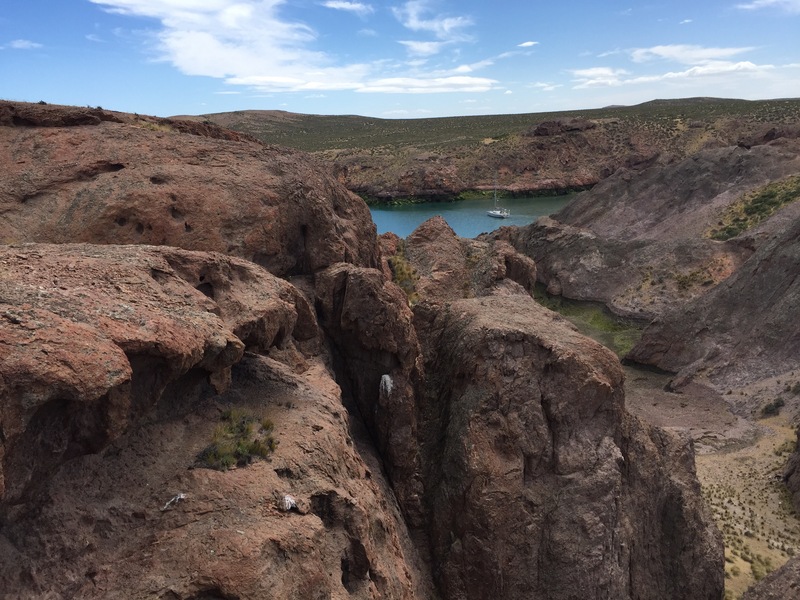 For those who are thinking of doing the Patagonian channels here are some of our impressions and data. We did an average of 47 miles a day, being on the move every second or third day to avoid the worst of the weather. We only had to turn around once , in Puerto Natales, because of adverse condition. We liked the place but next time will not do the detour which adds too much mileage through fairly exposed and rough water. We burned 1400 liters of fuel for engine use and heating. The engine , a Volvo D2-75, consumed 5 liter/ hour or about 1 liter a mile ( instead of the usual 3.5 liters per hour) a result of adverse wind and current. We anchored 35 times , whenever possible using 4 lines to shore. It takes a bit of practice but is not all that difficult, and the 4 lines rollers make it a fast operation. We found that the 2 critical steps were scouting the anchorage for suitable trees and making sure the anchor is well set and tested before doing the line runs. Dyneema lines worked best: suple, kink free, light and immensly strong. We will add a small 2.5 hp outboard forthe dinghy next time . A long trip but very feasible with a well heated boat , a good engine and a crew of 2. A good day in the channels: only 13 knots on the nose and 6 knots speed. It rains as usual but the inner watch station is very comfy. Haiyou performed flawlessly in these conditions. No breakage to report except my electric blanket and the zipper on the lazy bag! We will do a fair bit of regular and preventive maintenance here. The main addition we are planning to do is a small wall-mounted diesel stove to maintain room temperature without having to fire up the central heating ( Webasto). 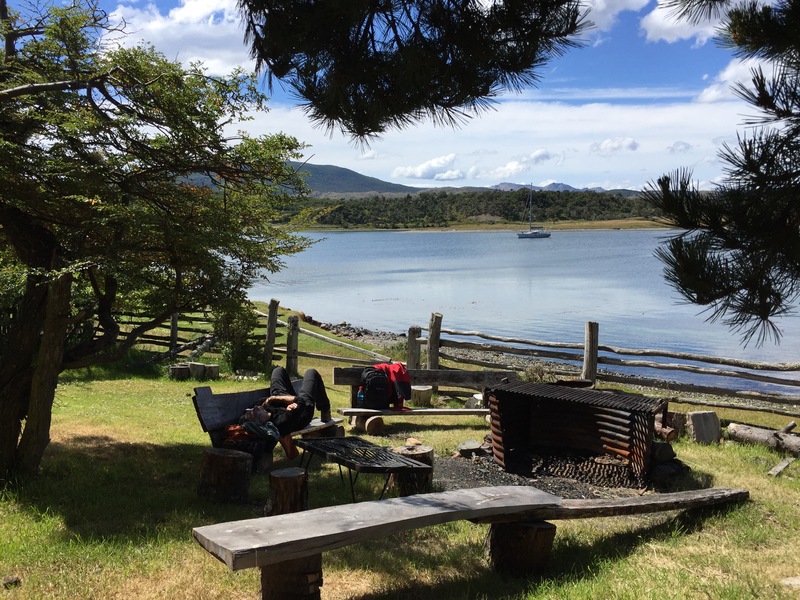 We are still in the patagonian channels enjoying the raw beauty of the end of the world. 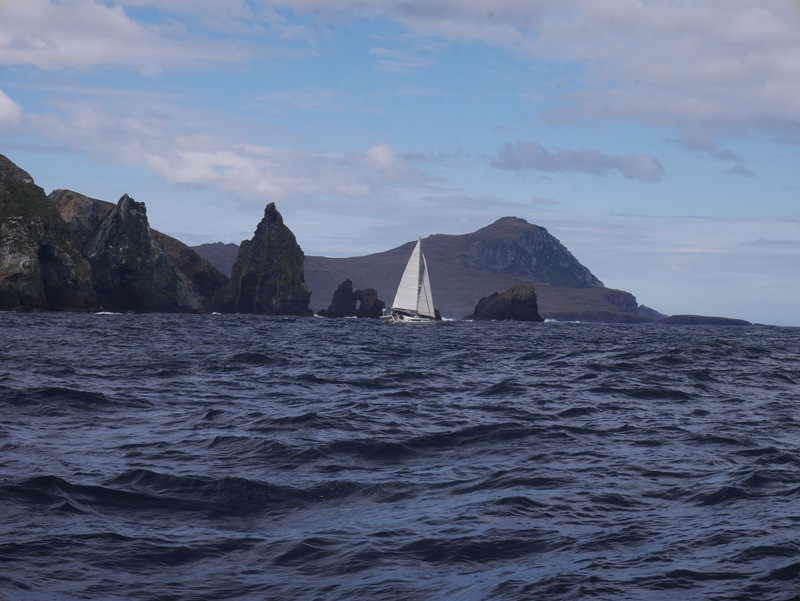 We started by rounding Cape Horn together with buddy boat Dandelion. The weather was calm that day and we almost felt like a cheat! But we certainly have paid for this later with quite a few weeks of stormy weather up the channels. 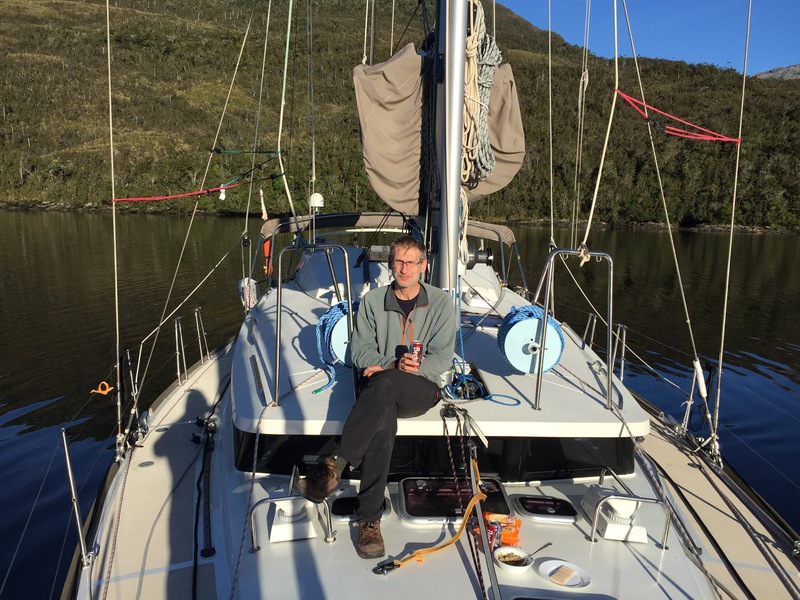 Anchored in Caleta Murray 10 miles north of Cape Horn with our good friends Sue and John and Michelle fron Dandelion. From there they headed North East to the Carribean. We hope to see them again. Rain ( or snow) and cold excepted this is a fantastic place to cruise with awe inspiring sights at every corner. The secret to a good night sleep however is to tie the boat to 4 sturdy trees on shore evey night. The gusts roaring down the montain , called williwas, can be very violent and pull the anchor out. The boat even pulled a tree out once. After a few weeks on the wet side we have crossed the Andes through a tiny gap in the cordillera to Puerto Natales on the leeward side , which is dry(er ) and sunnier and is the only inhabited place around here. Caleta Beaulieu, a lot of ice floes from the glacier. is always the first thing to run out ) and fruit and vegies & got an internet fix. 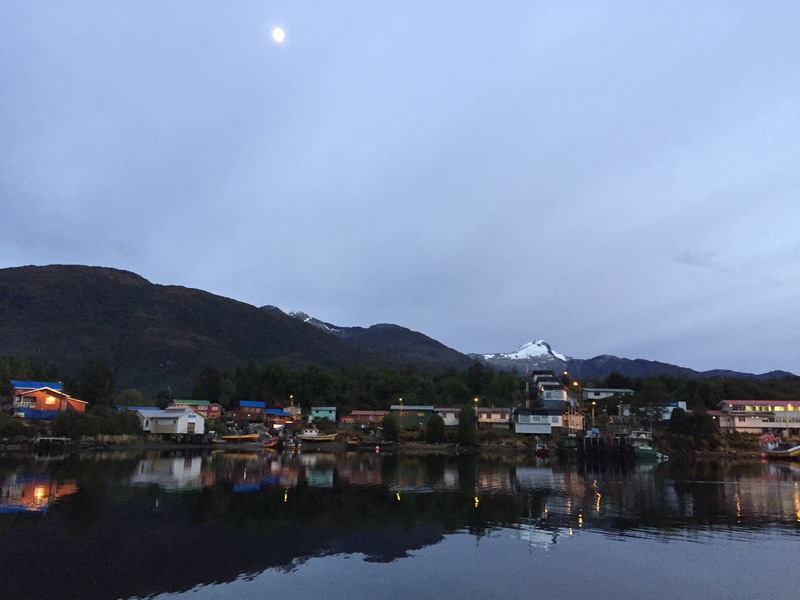 In a few days we will push off again, cross the Andes again and head towards the next harbour 450 miles north called Puerto Eden ( population: 150! ).It is fun! 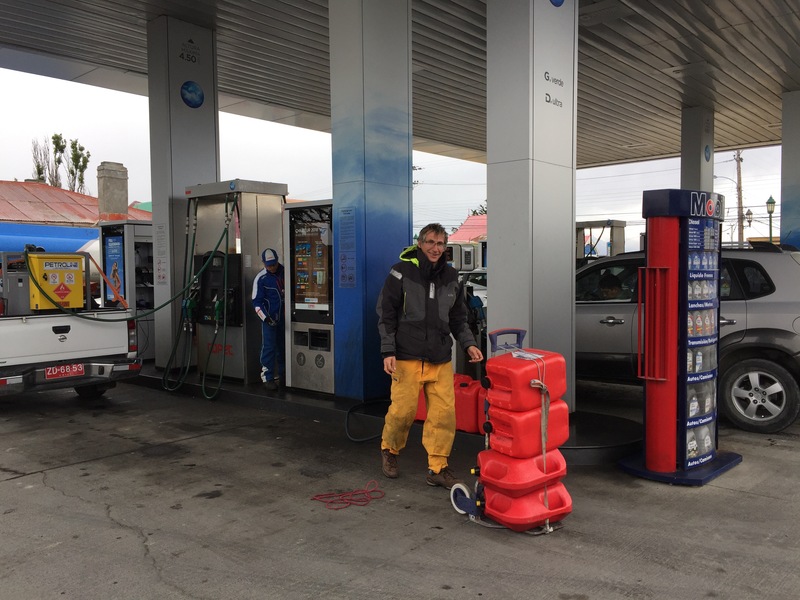 Refuelling means several trips to the gas station with Jerrycans. There are no docks for yachts here. A full day job! All is well aboard, and Haiyou is well suited for this type of work. We might install a Dickinson stove at some point as the webasto furnace , while working well , is not fuel efficient long term and we are comtemplating a second season in the South. 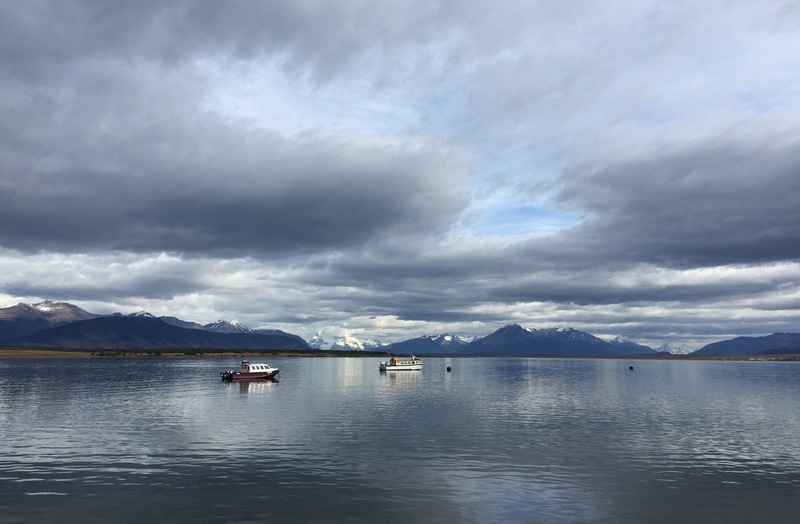 We had a fantastic trip heading South and as I write these lines we are in Ushuaia. Heading down the Argentinian coast was tricky because of frontal weather, some of the windows lasting only a few hours , but we managed to avoid the worst of the front and soon reached Caletta Horno a beautifull and safe anchorage . From there we did a 600 miles passage through the roaring 40ies an 50 ies to the Falklands, again waving through the depressions. 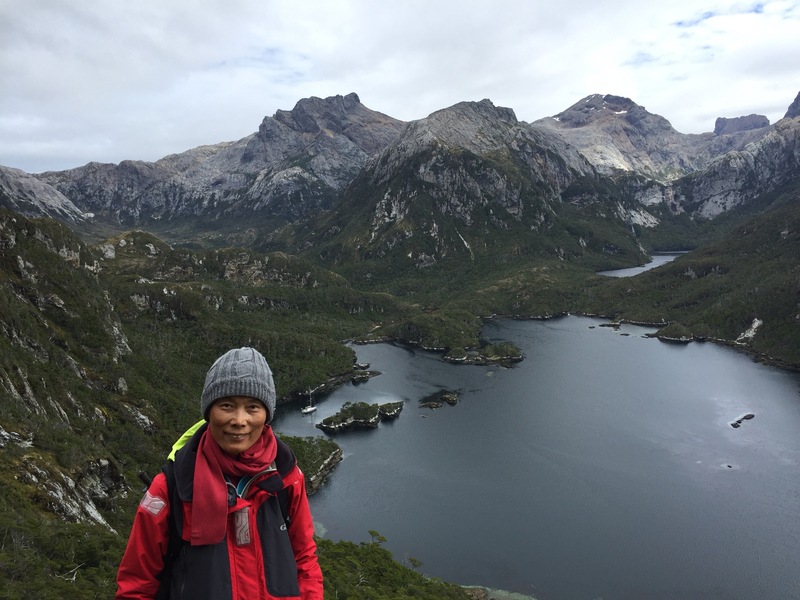 After a few days in Stanley the capital we headed west to discover this rugged archipelago, and its abundant marine life. 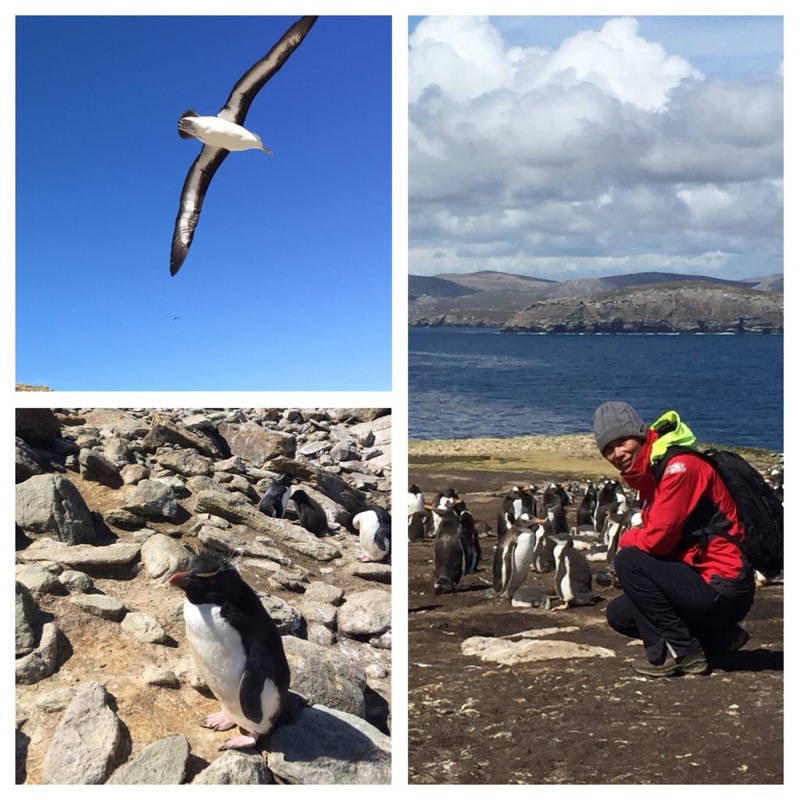 We saw many colonies of Penguins, Albatros and Shags ( cormorrant) ammong the cliff of the west islands. One of the highlight however was spending a week or so anchored off Beaver Island and getting to know Jerome Poncet, a French adventurer and explorer of the deep south who has settled there. We felt both inspired and very humbeled by Jerome’s achievement ( as well as his hopitality). What we are doing is a walk in a park in comparison. The Faklands in addition to being home to 3000 people of mostly british descant, harbours a lot of widelife as well as 600 000 sheeps! Then it was time to go and for a change we had no wind for the passage to Staten Island just off Terra del Fuego. It is wet and rugged, and totally inhabited. Our anchorage was perfect in a small bay entered through a pass of about 10 meters, hidden behind a small island and moored with 4 shorelines. 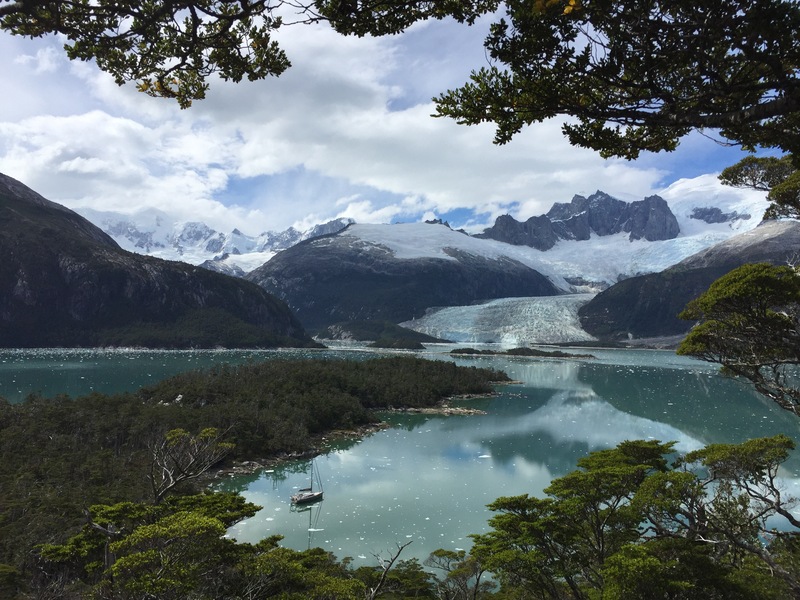 We did some beautifull if very steep hikes.We sailed through Lemaire straight, a nasty piece of water at night with the current and following wind, wing on wing, covering 31 miles in about 3 hours and entered the Beagle channel at dawn about 50 miles north of Cap Horn. We stopped in Haberton , the oldest Estancia in this part of the world and discovered the history of the great family who tried to save the local indians from the destruction of colonisation in the late 19th century. 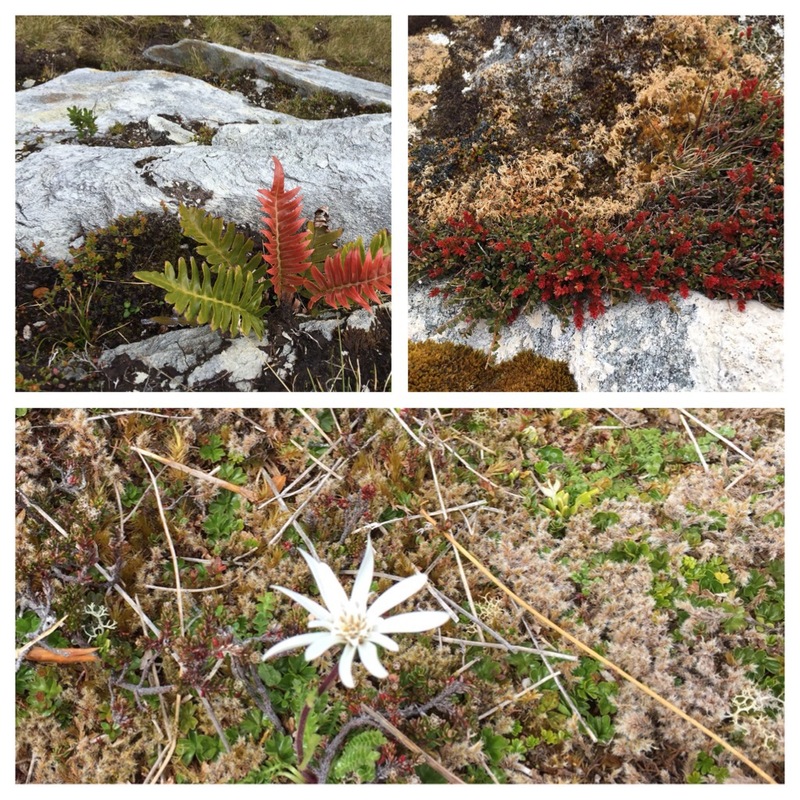 Sub arctic flora. It is spring here. We are now in Ushuaia to restock and refuel before going west then north through the Patagonian channels. This should take us about 3 months and by April or May we should reach Puerto Montt where we will rest for some time. The sailing has been good and overall quite windy. Haiyou performed well with no serious issue ( touch wood). I noticed the starboard top spreader had slipped and was bending downward under the strain of the shroud tension. I was able to staighten it and have slacken the main shrouds which I think were overtighten ( factory setting). We will see if this works. I have some prop cavitation above 2200 rpm when motoring in heavy chop. I am not sure how to solve this one. The car heater I have installed is really great and should be on every boat heading for cold water. We also found that an electric blanket does wonder. We put it on half an hour before going to bed and it remove all humidity. It only draws 4 or 5 amps. We wish you all an excellent new year and we often think of family and friends back in France, China and Australia or sailing the oceans of the world. After a few months in Europe catching up with family and friends we are back on Haiyou. The trip from France was a bit of an odyssey with 150 kgs of luggage , mostly gear for the boat…. + a suitecase full of chinese food. Uruguayan customs were very kind to let us in. They did stop us but soon realised it would be too hard to deal with all this stuff. 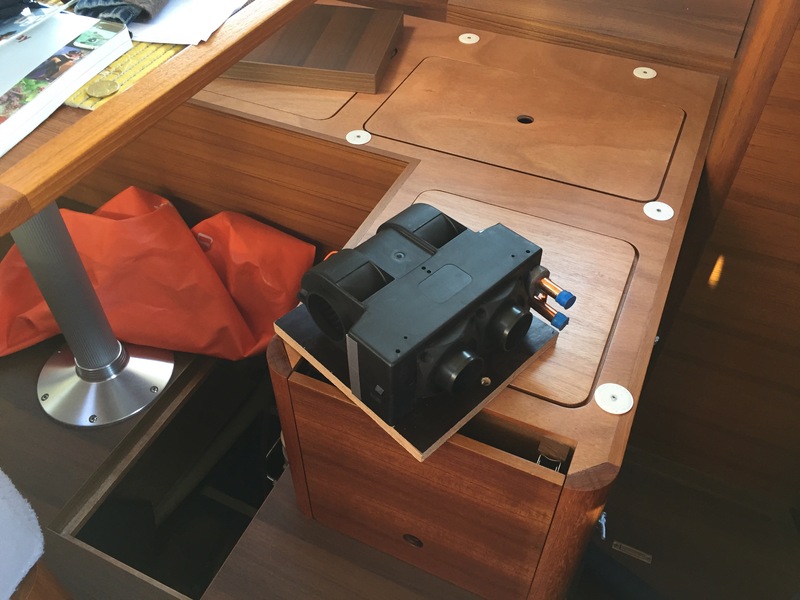 We then spent a few weeks getting the boat ready, including antifouling and installing some of the goodies we brought back. The one I am the most proud of is a secondary heater using waste heat from the engine and mounted in parallel to the waterheater ( hopefully nothing will leak). 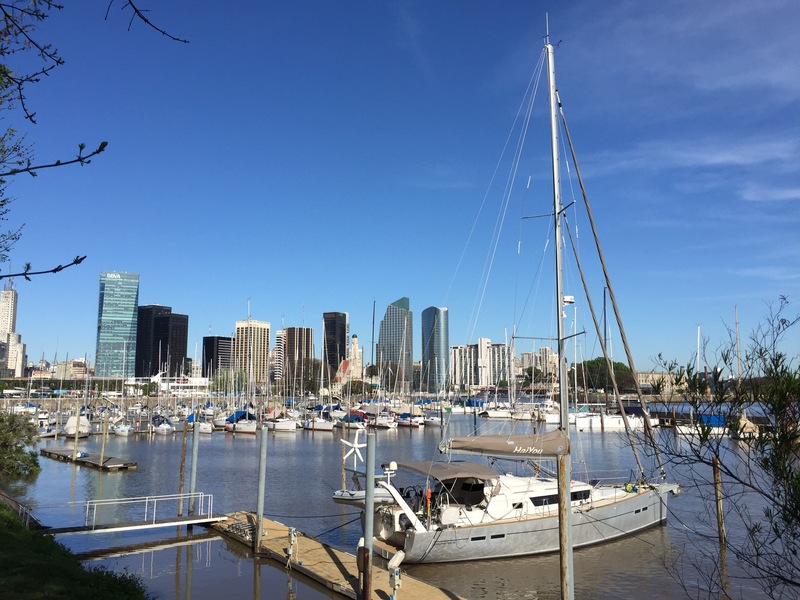 ﻿After an overnight sail along the coast we cleared out of Uruguay in Colonia and arrived in Buenos Aires the next day . We had been warned that Rio del plata is a treacherous place to sail. It is absolutely littered with wrecks, many of them still visible, as the water is only 3 or 4 meters deep.This in itself is a stern warning to mariners. I had an updated list of dangerous wrecks and spent a few hours marking them on the electronic chart. We got a taste of the weather a few hours after we arrived when we got hit by a 50 knots squall without any warning. We heard it before we felt it. I sounded like a freight train was approaching towards us. 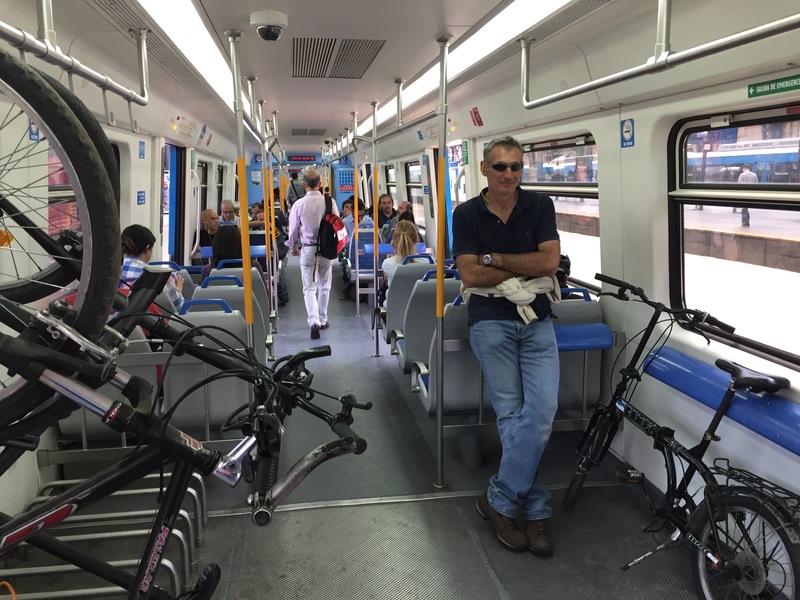 Buenos Aires is a very large city of 14 + millions people. It is not beautiful but quite grand with a vibrant cultural life. Lynn splurged on all the city had to offer. She dragged me to ballet , which I did enjoy in the end and to a show of Tango ( no need to drag me to this one!). 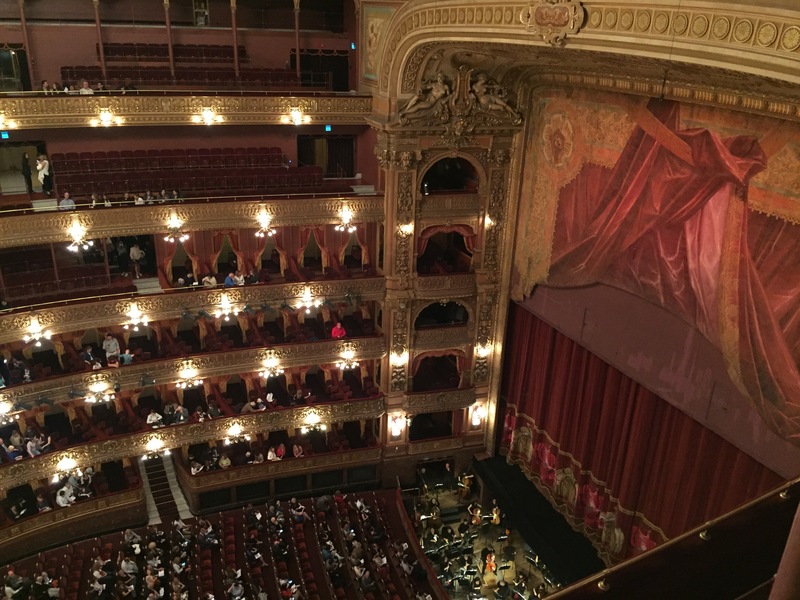 Standing ticket for ballet, but wha a view! Today we went shopping to replenish the pantry for the months ahead. 17 crates of food were delivered to our dock by Carrefour and that is only the dry stuff. As I write this post Lynn is burrying everything under the floorboards and she has asked me to go away for a few hours. Hopefully when I go back Haiyou is still floating. We are flying to Salta in the country northwest for a few days , then we will sail south to Mare del Plate, the Valdez peninsula and weather permitting Malvinas ( the Falklands).